SCP-2880-A35 partially reconstructed, on display at the █████ ███████ Museum prior to its containment. Special Containment Procedures: The one hundred and forty nine (149) known SCP-2880-A objects are contained in Secure Containment Locker 2880-A at Site-74, disassembled. Those who wish to reconstruct more than eighty-five (85) percent of an SCP-2880-A object for the purposes of testing should notify Site Command prior to their research. If an SCP-2880-A object is used for testing purposes, the SCP-2880-A object it is paired with should also be assembled and stored in a monitored, habitable location. Unless required for the purposes of testing, personnel handling reconstructed SCP-2880-A objects should not expose bare skin to the surface of the object. All known SCP-2880-B artifacts that can be safely relocated have been moved to Secure Containment Lockers 2880-B1 through -B32, also at Site-74. Any researcher with at least level 2 clearance may access SCP-2880-B artifacts with the supervision of a member of the Site-74 Archeology department. SCP-2880-B buildings and artifacts which cannot be safely relocated are stored at Provisional Areas 2880-B1 through -B68, located throughout the southern Pacific Ocean. Personnel assigned to provisional areas 2880-B1 through -B68 should be briefed by their Area Director on the cover story used by their assigned facility. Description: SCP-2880-A is a collection of destroyed earthenware pottery platforms of a uniform design. SCP-2880-A objects, when reconstructed, are approximately thirty (30) centimetres in diameter at their widest point and approximately six (6) centimetres in height at their tallest point. An SCP-2880-A object will not display any anomalous qualities unless at least approximately ninety (90) percent of both it and the SCP-2880-A object it is paired with are reconstructed into its original design and there are two (2) metres of space between the top of both objects and any solid objects above them. The second criterion is believed to be a safety feature purposely induced by SCP-2880-B. Humans1 that expose their bare skin to the surface of a reconstructed SCP-2880-A object will disappear. Within 0.07 seconds, subjects will reappear on the SCP-2880-A that is paired with the item that the subject touched. SCP-2880-A objects are pairwise connected and each consistently transports subjects to a single other SCP-2880-A object. Items with a volume of less than three cubic meters in contact with the subject, such as clothing or handheld objects, are also transported, with the exception of the SCP-2880-A object itself. Upon the disappearance of the subject, a quantity of fluid (in the majority of tests, air or water) with the same volume as the subject will disappear at the location of the subject's reappearance and be transported to the location of the subject's disappearance. The subject will fill the vacuum left by the disappearance of the volume of fluid, and the fluid will fill the vacuum left by the disappearance of the subject. Subjects transported by an SCP-2880-A object consistently display a far lower core temperature2 than usual upon their arrival and are often coated in saline water, even in tests not involving submerged SCP-2880-A objects. The majority of subjects report mild disorientation, nausea and headaches after using SCP-2880-A objects repeatedly. Long-term use of SCP-2880-A objects can cause repeated auditory, visual and tactile hallucinations in affected subjects. Recurring themes in these hallucinations include drowning, storms, and a large coastal cityscape. SCP-2880-B is the Foundation designation for the Savaki culture, the prehistoric Bronze Age Pacific Island society that created and utilized SCP-2880-A. SCP-2880-B controlled a large number of western Pacific islands between Taiwan and Hawai'i from about 2500 BCE to 1700 BCE, at which point they were gradually replaced by the Lapita culture and other pre-Polynesian groups. The disappearance of SCP-2880-B is believed to have coincided with the destruction of SCP-2880-A. The reliance on SCP-2880-A for trade, travel and transportation of resources is the most likely cause for the decline of SCP-2880-B's society. It is currently not understood why the SCP-2880-A objects were destroyed, or why SCP-2880-B chose not to rebuild them. Provisional Area 2880-B1 The entirety of Savaki3 SCP-2880-A1, SCP-2880-A2, SCP-2880-A3, SCP-2880-A16 Largest and earliest discovered group of SCP-2880-B sites. Due to its extremely high density of SCP-2880-B artifacts, the existence of the island has been expunged from public records. The majority of SCP-2880-B sites discovered are believed to have been destroyed by storm damage. Provisional Area 2880-B2 Approximately two kilometers east of Lorengau, Manus Island, Papua New Guinea SCP-2880-A4 The majority of artifacts discovered at the site were created by the Lapita culture, but a small minority were created by SCP-2880-B. The style and content of several petroglyphs indicate that they were created by SCP-2880-B. The petroglyphs, which date to approximately 1600 BCE, depict several humanoid figures and animals fleeing from a larger humanoid figure, believed to represent a member of SCP-2880-B. Provisional Area 2880-B3 The western coast of Yonaguni, Japan SCP-2880-A5, SCP-2880-A6, SCP-2880-A8, SCP-2880-A12 The site discovered is believed to have been used by SCP-2880-B as a trading post of some kind. 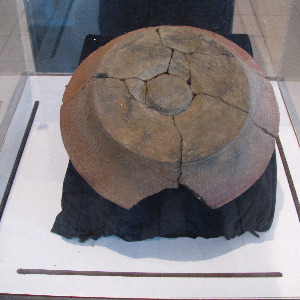 Recovered artifacts indicate that SCP-2880-B regularly traded with the Longshan culture, Middle Jomon peoples, and the Indus Valley Civilization. Provisional Area 2880-B4 Honolulu Watershed Forest Reserve, Oahu, United States SCP-2880-A7, SCP-2880-A9 The SCP-2880-B site discovered was initially believed to be a mass grave, due to the large quantity of skeletons within it. However, later study of SCP-2880-B indicated that they removed the heads of bodies prior to burying them and stored them in a separate location, disproving this initial hypothesis. The site is now believed to be the location of a large battle or revolt against SCP-2880-B. Mitochondrial DNA extracted from the molars of the skeletons indicate that the battle was between SCP-2880-B and another proto-Polynesian group not native to the island. Provisional Area 2880-B9 Northern coast of Motu Tiahura, French Polynesia SCP-2880-A14, SCP-2880-A15, SCP-2880-A43 Provisional Area 2880-B9 represents the first time two connected SCP-2880-A objects (SCP-2880-A14 and SCP-2880-A-15) were discovered on the same island. As SCP-2880-A15 was discovered within the remains of an outrigger canoe, it is believed that it was to be transported to another island. Other recovered artifacts indicate that the transport of SCP-2880-A15 was interrupted by a conflict between SCP-2880-B and another group. Provisional Area 2880-B10 Mt. Silisili, Savai'i, Samoa SCP-2880-A18, SCP-2880-A19, SCP-2880-A20, SCP-2880-A21, SCP-2880-A22, SCP-2880-A23, SCP-2880-A24, SCP-2880-A25 The most notable feature of the SCP-2880-B site contained within Area 2880-B10 is a large, fortified structure believed to have acted as the residence of the leader(s?) of SCP-2880-B during its period of dominance. A mass grave is located beneath the "courtyard" portion of the structure. Approximately two hundred skeletons, with their skulls removed, are arranged in multiple symmetrical patterns within the grave. Mitochondrial DNA extracted from the molars of the removed skulls indicate that the bodies came from various south-western Pacific societies known to SCP-2880-B, and that none of the bodies were members of SCP-2880-B. Examination of the bones indicates that those buried at the site were cannibalised prior to their death. The structure is believed to have been destroyed during a conflict between SCP-2880-B and another group at approximately the same time as the destruction of SCP-2880-A. Provisional Area 2880-B35 Langila, New Britain, Papua New Guinea SCP-2880-A52 The majority of artifacts discovered at the site were created by the Lapita culture, but a small minority were created by SCP-2880-B. Two SCP-2880-B petroglyphs have been recovered from the site. The first depicts two large groups of humanoid figures armed with spears fighting each other, surrounded by spherical objects believed to represent SCP-2880-A. The second petroglyph depicts the two groups being killed by a large humanoid figure surrounded by storm motifs. Lines emerge from the depicted SCP-2880-A objects into the large humanoid figure. It is currently unknown what the humanoid figure represents. 1. Hereafter referred to as "subjects"